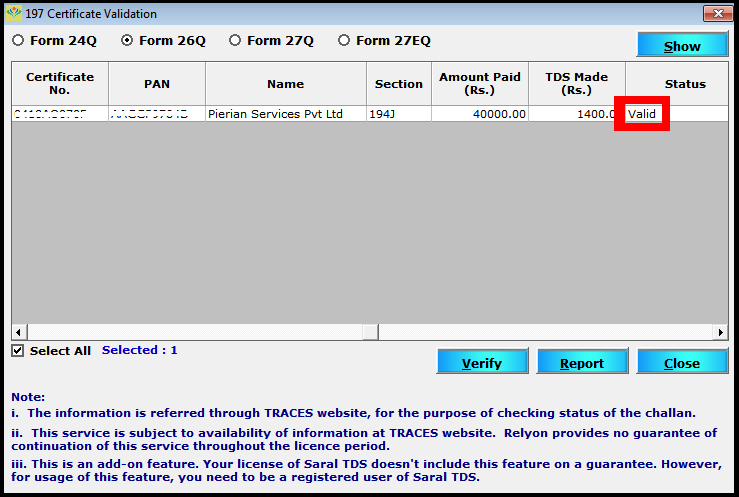 Hello and welcome to the tutorial post on steps to verify Lower deduction certificate using Saral TDS software. What is a lower deduction certificate? Lower deduction/No Deduction U/S 197 is the certificate given by the deductee to the deductor for reduction of TDS on the payment to be done. This certificate is obtained by the deductee form the Income Tax Assessing officer on providing relevant information of income. On receiving the certificate, deductor will deduct the TDS at a lower rate as per the certificate details. 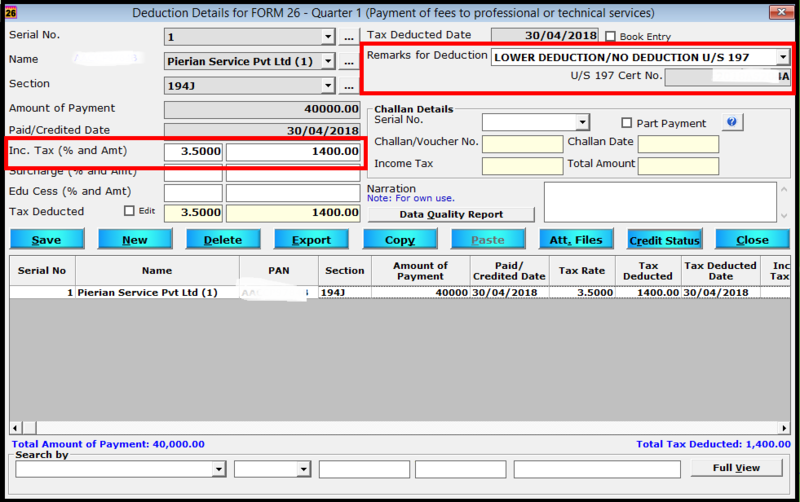 To provide the details of Lower/No deduction in Saral TDS, go to Deduction details under the required quarter of Form 26Q. Enter the Deduction details. Here, the rate of tax has to be the rate which is mentioned in the certificate. Also, select Remarks for deduction as “LOWER DEDUCTION/ NO DEDUCTION U/S 197”. Now, provide the certificate number. Once the certificate number is entered, we must verify it from TRACES to see if it is valid or not. 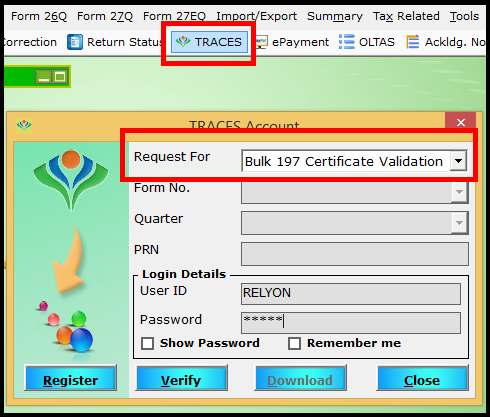 To verify the details, go to TRACES Account in quick menu option and select Bulk 197 certificate validation in Request for. Enter the TRACES login credentials and click on Verify. On clicking Verify, details will be redirected to TRACES login. Since we logged in from Saral TDS, User Id and Password will be auto fetched. We need to enter the verification code and click on Login. After login, you will be redirected to Saral TDS. Here, select the form and click on Show. 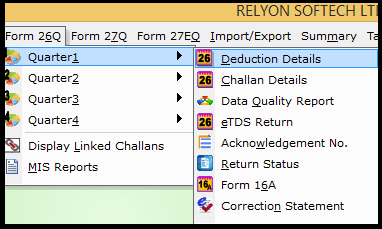 Next, the deductions with certificate details (previously entered) under the selected form (26Q) will be displayed. Select the required deduction(s) and click on Verify. On clicking Verify, the verification process will start in TRACES login. The certificate will be verified and the status will be displayed on the screen as VALID or INVALID. Also, we can see the certificate details in the open browser. Here, check if the deduction falls with the period and section of the certificate. The deduction can also utilize the certificate only if the amount is available for usage. i.e., the amount forms the difference of Certificate Limit and Amount Consumed. Else, the certificate should not be used as this will give rise to the default of Short Deduction. 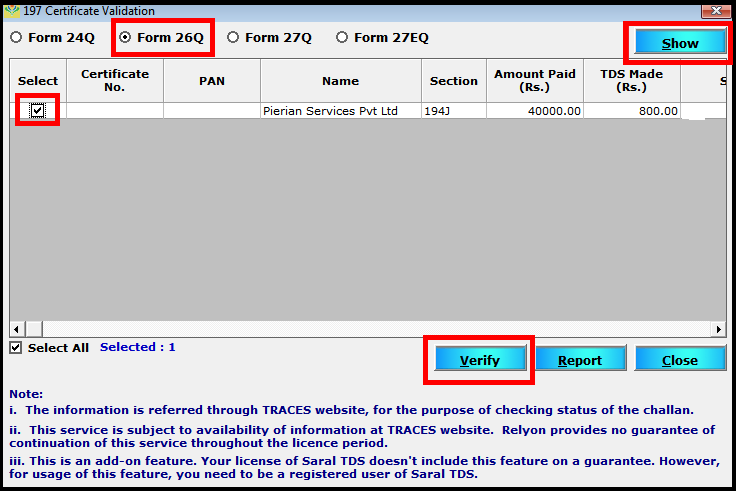 And that ends the process of verifying lower deduction certificate using Saral TDS.